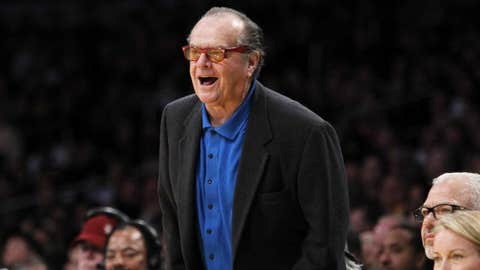 Actor Jack Nicholson is one of the most well-known celebrity NBA fans and can be seen sitting courtside at almost every Los Angeles Lakers home game. When the Cavaliers visited the Staples Center on Tuesday night, it sure didn’t seem like there was any love lost between Nicholson and fomer Lakers head coach/current Cavs coach Mike Brown. With time running out in the first half, Brown, coaching his team from the sidelines (as coaches are supposed to), can be seen obstructing Nicholson’s view for a quick second. Good thing Coach Brown wasn’t in the way during the end of the game, as the Cavaliers went on to beat the Lakers 120-118. It was the first game for Brown against the Lakers since the club fired him five games into last season and replaced him with Mike D’Antoni.